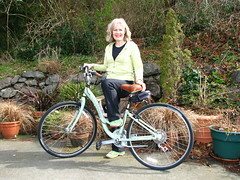 In an effort to outfit my biking partner for an exciting season of bike path cycling, I found a women's hybrid on Craigslist that fits her to a T. Esther is tickled with the brown leather seat and handgrips, the low step frame and the foam green color. It's a Trek 7000 wsd which retails for $360, but we got last year's model for $175. She will be all ready to hit the bike paths with me this spring and summer. It sure would be nice if we could have some consistent spring weather. Markus came home today as he will have his spring break this coming week.